Jean-Francois arrived from Singapore on Saturday last with renewed energy and a clear goal: Complete our vegetarian cookbook in six weeks. But that requires a clean kitchen and an empty fridge. To prepare, I made all our meals with an eye to waste nothing and have no food in our home by the end of the week. For the most part our meals at home are vegetarian. Not vegan, but meat is rarely on the menu. This week was no exception, save for an evening of miso-glazed halibut (wild caught from Alaska, approved by our Seafood Watch app) and served with flavoured rice and lemon roasted brussels sprouts. I only mention this meal, because it is the trigger for what follows. I had leftover rice and sprouts from that meal, so for last night’s dinner I wanted to give these morsels a second chance to dazzle. And use up some aging produce. Here is what I did. Everything but the asparagus was either a leftover or on its way out the door. (Note: I made the meatballs about six weeks ago and froze them in batches of 6, we thawed our last bag for future meals. 1. Warm the meatless meatballs. Preheat over to 350F. Place meatless balls in baking dish, cover tightly to prevent drying. Heat in over about 20 minutes, until heated through. To food processor and pulse until it becomes a coarse paste. Set aside. Set aside until ready to serve. Until browned, about ten minutes. Turn off heat and add 1 tablespoon fresh lemon juice and 1 tablespoon butter and toss until sauce coats stalks evenly. Serve. The pesto also serves as a dipping sauce for the meatballs. Jean-Francois topped his rice with the lemon-butter sauce. We thought the blue cheese might over power the pesto, but the two were very nicely paired. We will use the remainder of the pesto with pasta on Saturday. The rice was rather tasty. We had enough fried rice leftover to make an egg hash for breakfast. Just add two eggs. Those meatballs are very dry, made more so by the freezing. Considering the long list of ingredients and the time required to prepare them, you will want to make sure you find ways to “pimp them out”. The recipe makes 24 balls, which is a lot for two people. And since I am not a fan of lentils, I doubt I will be making these again. All told we managed to eat every bit of veg in the fridge. When we shop on Saturday, it will be like starting with a new fridge. On another note: I am in search of muslin cotton for making tofu and soy milk. My supply has turned to rags and I cannot find any cheesecloth here that is fine enough. If anyone can point me to a decent vendor, I would be over the moon. We miss our tofu and milk. Thanks. 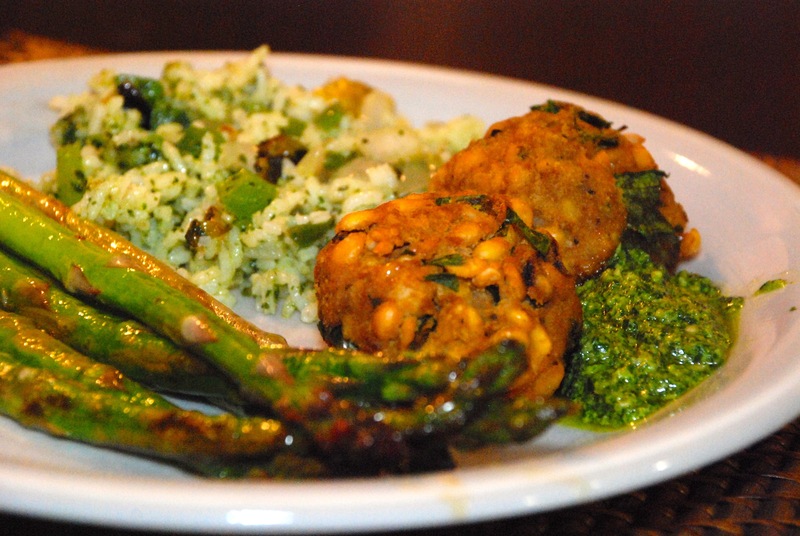 This entry was posted in Waste less recipes and tagged asparagus, blue cheese, Brussels sprouts, food waste, fried rice, leftovers, Meatball Shop, meatless meatballs, pesto, rice, sustainable living, vegetarian, Waste less recipes by Bonnie Lee. Bookmark the permalink. I can’t believe I just had pesto (kale, pine nut, garlic, olive oil) for the very first time EVER this past weekend. I just never got the memo. I’m hooked. Okara meatballs? Must try making some with leftover from the soy milk making process! Back in my cheese-eating days, blue cheese was my favorite of them. Thank you for the kind words. I love that SeaWatch application. It was disappointing at the fish market to see some lovely filets of red snapper just begging to be grilled only to learn that they are overfished and endangered. It is good to know that most fish from Alaska is sustainable. Somehow seems odd that such a conservative state would take conservation so seriously. The meatballs are lentil based, I added a cup of okara fresh okara to the mix (because I did not have eggs on hand) and was happy with the binding results. Wish I liked lentils more. I am curious how much okra you used to substitute for the eggs. I have a son with an egg allergy and am always looking for eggless recipes. Thanks! I put pesto on hamburgers and it is so good. That sounds yummy. I tend to use pesto to help welting vegetables taste better and I have added to soups when the broth lack punch. I want to try seeing how many different greens make decent pestos: Carrot tops, parsley, and spinach work. Have you tried mixing up your pesto? I’ve had it on my organic salads alot and it has a kick with spagetti.The other “pesto type” I make is the tomatoe,avacado,onion and parsley.Instead of a chunky like salsa I blend these to make a cream.its really good. I like the idea of make a cream sauce with salsa and guacamole. It would be an easy way to “mask” slightly older veg and still redeem its flavour. Thank you for sharing.